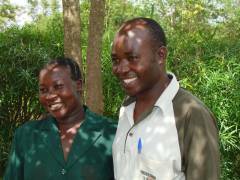 The Christian Fellowship Churches (CFC) and Child Care Ministries (CCM) in Busia, Uganda, offer holistic ministry and care to devastated communities filled with the uneasiness of wars, hostile nomadic tribe invasions, HIV/AIDS, disease and poverty. They offer the Good News of Jesus while showing and practicing His love. They provide counselling, micro-loans, education and training for churches and pastors. In 1999 BHW personnel met a Ugandan man studying in Auckland, New Zealand. He went back to Uganda a few weeks later and continued with his work in Uganda. That work related to church planting and orphan care in these churches. A small level of support was commenced. In 2000 the first trip was made to see the situation there and to assess the opportunities. It was agreed that there were some real opportunities to develop partnership in the area and so BHW developed and increased the partnership. The key man left the organization a couple of years later and others took over. The leadership grew stronger as did the partnership. The number of churches grew and the number of children grew as well. 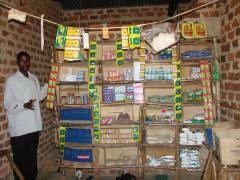 In 2004 micro-enterprise was introduced and the funding for that started in 2005. In 2007 the board was restructured. Committees were formed to oversee the development of various departments and the personnel on the Board was reshaped. Bright Hope personnel have often visited and the partnership continues to grow. The primary beneficiaries are the members of the CFC churches. They are able to access micro-enterprise loans and register orphan children for education assistance. Pastors are also able to be trained and have access to the micro-enterprise loan programme. We like this partnership because it not only is evangelistic in nature but it is also a shepherding and holistic ministry caring for all of the community needs. This partnership has enormous room for growth which will enable the CFC-CCM churches to bring hope, relief and teach the Gospel to the surrounding areas. The outstanding aspect of this partnership is the micro-enterprise component. Many families have access to funds to establish businesses and each year more are able to become involved. James and Gorret have lived in this community much of their lives. James has lived in this village all his life. Currently he is the headmaster of a primary school some kilometres from his home. He goes to school on his bike every day. Gorret looks after their children but is a very busy woman with other roles as well. Gorret oversees the development of the loan and micro-enterprise programmes and travels around the district running seminars, training and holding accountability meetings for the various clubs that have formed. The vision in this partnership is to assist the poor and vulnerable in the community and to plant new churches in communities that have none. The strategy is to plant two or three churches a year. As the churches develop they register children into the programme and they are assisted to go to school. As the church becomes established a micro-loan programme is started in the church. There is huge potential here and much more could be poured into this partnership so there is opportunity here for other donors to be involved. Lorukhama is a pastor of the CFC church in Kubo. As a pastor, she encouraged her congregation to work hard. The congregation did not listen because they saw that she worked yet was still very poor. After hearing about the loan programme from the CFC, she and some other members of the congregation began to save. After they had some money saved, the CFC added to the pool and the loans began. Lorukhama was very successful in her small business of selling soap, paraffin, and fish. After six months she paid off her first loan and accepted another loan to grow her business even more. Now, when she teaches people about hard work and how to sustain themselves, she speaks with confidence and is a model to them. She also tells others how Jesus is able to do miracles, as he lifted her from her poverty.